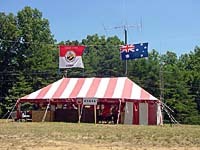 Amateur Radio — Live from the Jamboree! 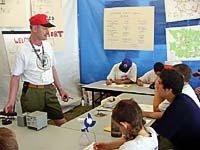 The National Scout Jamboree was held July 23-31, 2001, at Fort A.P. Hill in Bowling Green, Virginia, as have the previous five Jamborees since 1981. 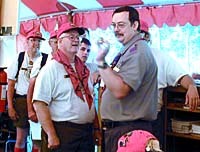 At K2BSA, we had a staff of 44, under the direction of Ed Dudley WA4ISI and Ray Moyer WD8JKV. 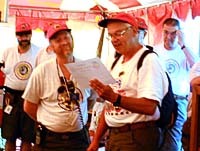 The staff was further divided into a Merit Badge Midway crew (Bill Burns WA6QYR in charge), the station operators (Gene Keys WB4NLM and Dan Moore KA8DRR, shift supervisors), a license class / VE testing section (John Cross AB5OX) and the "other" group (Jerry Friedman WA2FQA, Russ Mickiewicz, N7QR and myself, Mike Brown WB2JWD). 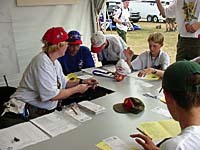 The Scouts' first day at the Jamboree was Monday the 23rd, but the K2BSA staff began arriving a week earlier. Although the lack of electricity slowed things down, we were ready to go by the time the power arrived on Saturday the 21st. "Other" staff Jerry WA2FQA and Russ N7QR assemble one of the beams - we had single banders for 40, 20 and 15, and a tribander as well. Bill WB9CAC assembling the tribander. By Sunday afternoon, the entire staff was assembled. Rappahannock Power's bucket truck helps raise the 20M beam. 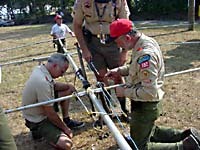 A new feature at the 2001 Jamboree, courtesy Brian N5ZGT, was hidden transmitter hunting, using "tape measure beams". 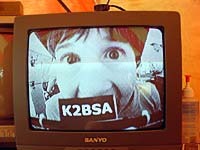 A Scout tries out the "K2BSA helmetcam" brought by Ray WD8JKV. The pictures were remarkable, if the movement made them a bit nauseating. This was the first time Jamboree participants earned their ham licenses, and had their new call signs in time to make first contacts with K2BSA before the Jamboree was over. 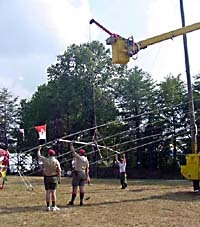 Above, the first three new hams at Jambo 2001. 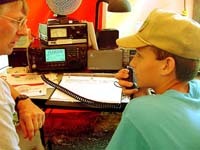 Of course, the primary purpose of K2BSA is to introduce ham radio to Scouts, preferably by getting them on the air. 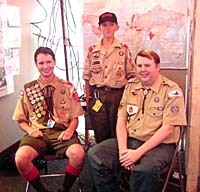 Here are a few of the many Scouts who overcame mike fright to talk on the radio. 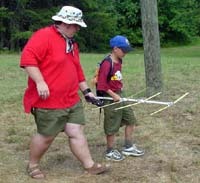 Andy KF4NVE demonstrates satellite tracking to Scouts at the K2BSA "Special Modes" station. Contacts were made through a number of satellites, and many more were heard. 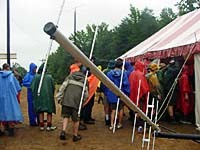 One of the rainy days at the Jamboree - and the lines of dripping Scouts waiting to get into K2BSA. Satellite antenna in foreground, with raindrops. Meeting many friends and acquaintances from my 27 years of Scouting, including some I hadn't seen for years, and others I only knew from overseas events. Having a staff member lose a loaned piece of equipment at an arena show, and while we were searching for it, learning that a Scout had turned it in to lost-and-found. Visiting his troop, and having them refuse our offer of a pizza party as a reward. Scouting does work! One of our other staff members having a lost digital camera returned from lost and found with a new picture added, reading "You're Welcome! 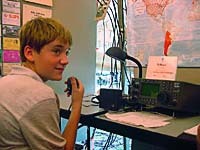 The transportation staff..."
Loaning my spare HT to our newest ham Scout, and hearing it on the repeater continuously for the next three days. 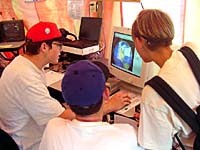 One of the more interesting modes at this Jamboree was SSTV. For the first time, we were able to really demonstrate it, thanks to the SSTV speaker-mic from Kenwood, and software for the PC to decode the pictures (at right). 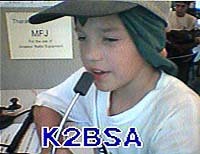 I was able to send pictures around the K2BSA area, and quite a bit further, using the Kenwood mike on a handie talkie. At far left, Billie WB8TRK at the Mosby Road Staff Mess Hall, in a first test of the system, when I was able to send pictures of the night's meal to salivating staffers back at K2BSA. This year's "super contact" was with the International Space Station. Seventeen Scouts got to talk to astronaut Susan Helms. 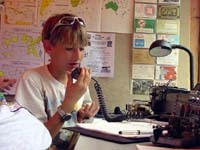 K2BSA youth staff acted as operators for the Scouts talking to the space station - above, Brian N5ZGT helps a Scout. 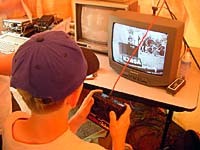 The K2BSA "Mars Rover" Amateur TV demonstration was back again, with a twist. 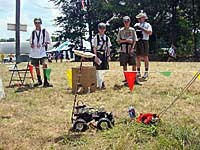 The Scouts were set the problem of steering a radio-control truck around a course set up outside the tent, as in 1997. This time, though they were looking for "Martian fauna" (stuffed animals). When an animal was found, it had to be identified in a "field guide" and checked off on a list. I ran into a troop leader as I walked back from K2BSA on the first day of the Jamboree. I asked her how she liked the Jamboree so far, and she was walking on air - "where else can you go, and everyone you meet says 'hello' and asks how things are going? And means it?" Sixty seven check-ins at one night's Jamboree net. 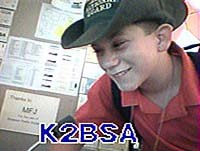 The many, many Scouts who couldn't stop grinning as they came back to K2BSA to report passing their license exams. 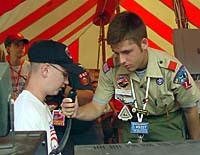 The many other Scouts experiencing the wonder of the first time a voice from around the world responded to them. Susan Helm's voice coming back from the International Space Station in response to our call. Scrambling to change radios, as it was obvious the omni antenna on the back-up radio was working better than the beam (don't think anyone noticed). The Scout on stage at the closing show who couldn't light his juggling torches, and the applause when he left the stage... and the comment from the Scout in front of me, that "it doesn't matter that he couldn't make it work, it took guts to get up on stage in front of 50,000 people". The 85 year old Assistant Scoutmaster at the closing show playing "America the Beautiful" on the Singing Saw... and 35,000 Scouts spontaneously starting to sing along. 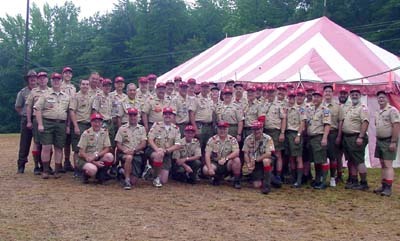 Bill's merit badge midway crew taught a record number of Scouts at this Jamboree. At right, some pictures from the Midway operation. 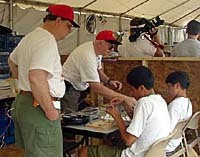 Completing the operating requirement at the "Ed Dudley Memorial Lounge" outside the K2BSA station tent. 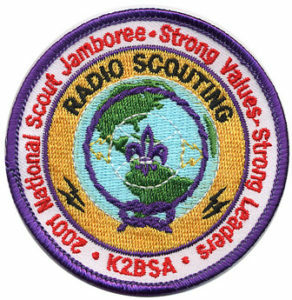 All information on this website is provided to support Radio Scouting Activities. You are welcome to download and modify all materials in whole or in part for your Scouting activities.